Located off of Pacific Avenue the Black Star is a sports bar featuring local beers on tap and a great menu including some seasonal favorites. 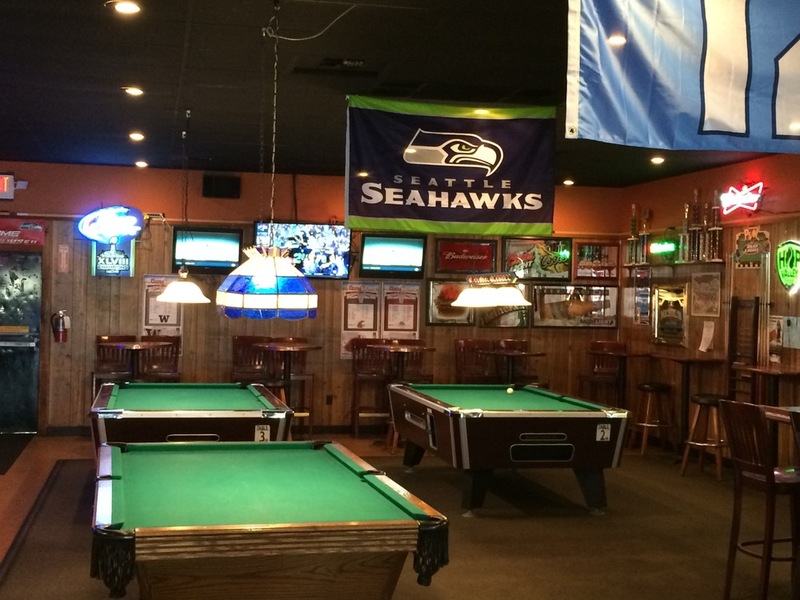 Opening its doors in 2006, the Black Star quickly became a community favorite offering a traditional sports bar with a great menu of even greater portions. We are a family owned bar priding ourselves on our great service, friendly and inviting atmosphere and a menu sure to keep you coming back. 1/2 pound patty, bacon, pepper jack, lettuce, tomato, red onion, grilled jalapenos and chipotle mayo. 1/2 pound patty, grilled onions on a french roll with au jus. 1 pound patty, bacon, lettuce, tomato, red onion, 1000 island, mayo and choice of cheese. 1/4 pound patty, mayo lettuce, tomato, red onion, and choice of cheese. 1/2 pound patty, sautéed mushrooms, swiss, mayo, lettuce and tomato. 2 1/4 patties, bacon, mayo and choice of cheese. Ham, turkey, bacon, cheddar, lettuce, tomato, mayo on toasted egg bread. Crispy or grilled chicken breast, bacon, avocado, lettuce, tomato, onion and mayo. Bacon, lettuce, tomato, mayo on sourdough. Thin sliced roast beef on a french roll with au jus. Thin sliced roast beef, grilled onion, green pepper, mushroom, swiss on a french rill with au jus. Corned beef, sauerkraut, swiss, 1000 island on grilled rye. Our center cut top sirloin cooked to your liking, baked potato, salad and garlic bread. Three pieces of tempura battered cod, fries and coleslaw with tartar and cocktail sauce. Three chicken strips, fries and your choice of dipping sauce. Buffalo chicken and blue cheese crumbles with house made mac & cheese topped with panko crumbs. Pecan wood smoked pulled pork with our house made mac & cheese topped with panko crumbs. Black Star chili with our house made mac & cheese topped with panko crumbs and fritos. Iceberg, chicken, bacon, avocado, blue cheese crumbles, black olives, tomato and sliced egg. Romaine, crispy or grilled chicken, caesar dressing, croutons and parmesan. Fried tortilla shell, shredded lettuce, spicy ground beef, shredded cheddar, tomato and black olives. Iceberg, turkey, ham, swiss, cheddar, cucumber, tomato and egg slices. Dinner salad with your choice of dressing, bowl of our soup of the day and garlic bread. Grilled chicken, coleslaw, tomato, red onion, pepper jack, thai chili sauce in a deep fried tortilla. Grilled chicken, bacon, tomato, red onion, cheddar, ranch and shredded lettuce. Tempura battered cod, cabbage, pico de gallo and chipotle tartar. wake up with a bloody mary! PLUS FOUR HANDLES ROTATING SEASONAL & UNIQUE LOCAL BEERS! For Reservations please call (253) 535 6688. Parties of six or more should make a reservation to ensure a table.